These days, the weather is alternating between 90°F and muggy, and 65 °F and rainy. But either way, my cheese is freezing! This is not a euphemism. Rather, it's a tip: Many types of cheese freeze extremely well, in fact. And it's what I do with most of my cheese leftovers (yes, I do have some), resuscitating them for an encore performance to fill out future cheese platters. Do they taste as great the second time around? Not quite, frankly, but how much flavor or texture is lost depends on the cheese and is generally so low, I'm a fan of the procedure anyway. As a rule, fat freezes better than water. That's why a frozen-and-defrosted vegetable or fruit never quite tastes like fresh. Too much water content. If you've ever tried to freeze low-fat milk or yogurt, you'll know what I'm talking about. Ice cream, on the other hand, tastes great frozen. Higher fat cheeses -- soft, creamy (even double creamy) cheeses freeze really well. Or rather, more to the point, they thaw really well. Once thawed, they once again taste creamy and lovely. Hard cheeses also freeze well, however. They may end up a tad more crumbly once thawed, but overall OK. The only thing that really doesn't freeze well is a very fresh, soft, mousse-y cheese, which obviously is much higher in water content and, therefore, will get ice crystals and never thaw close to original quality. If you have low-fat cheese, not only should you not freeze it, you should not even eat it. In fact, let's go back a step and say you should not even buy it in the first place. Any health benefit you gain is so microscopic, yet the loss of quality in texture and flavor is so great. Are defrosted frozen cheeses 100% perfect? No, in general, there is just the tiniest bit of texture and/or flavor loss. But really, the amount of quality that's lost is not so great that it's worth worrying about. And it's certainly not worth wasting a great cheese. These thawed cheeses make great little nubbins for toasting as part of a grilled-cheese sandwich, or on a salad, or melted onto some sort of tart. They even work well enough as part of a cheese platter. If you've been to my place, you may very well have consumed previously frozen cheese and not only lived to tell the tale, but not known the difference. And how to store it in the freezer? I put nubbins together in a glass storage container with a good seal on it, so that my coconut gelato won't taste of Camembert. You could also use a good air-tight plastic container, ideally one you will only use for cheese as it will permanently smell a little on the inside. I separate the pieces of different cheeses with some waxed paper when they're really stacked in there, then relax about that as the container empties out. I can just pull out little chunks every now and then. I do mix the very stinky with the very mild, and while this can spell trouble in the fridge, it seems to work just fine in the freezer where they are so cold, they don't emanate and share stink-rays with each other. 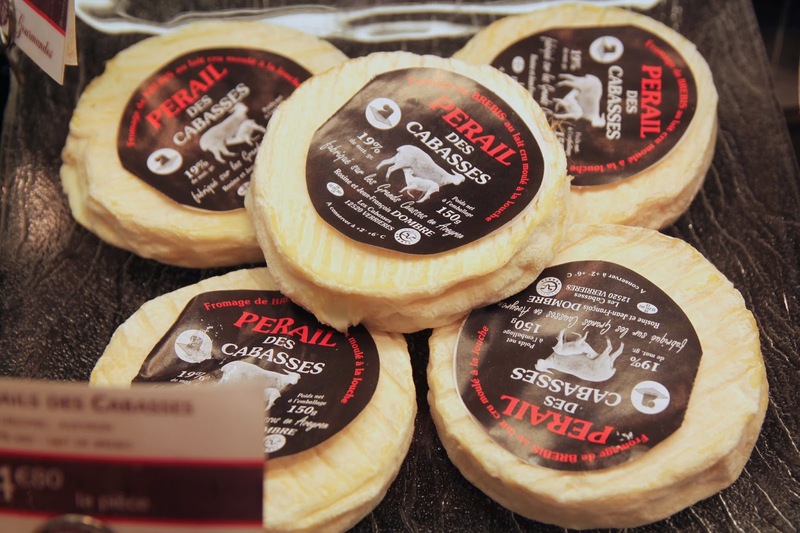 Perail des Cabasses is a raw sheep's milk cheese that hails from the Grands Causses in Aveyron. The specific town where it is generally made is, not surprisingly, Les Cabasses. All of this is to say that it's in Roquefort country, which I tell you for a reason. Originally, the cheese was produced at the beginning and end of milking season, when the milk production was low -- so low, in fact, that it was insufficient to make Roquefort. But they weren't about to waste it. So they made this disk instead and did not inject it with or expose it to blue molds. Instead, it's poured directly into molds by the ladle, and then aged in an entirely non-blue manner. The cheese is creamy and thick. And, nowadays, you can get it year round. This cheese is 19% fat, and I know that very precisely because it's right there on the label. That may be lower than some, but it's still high enough to freeze well. I also know it's supposed to be preserved between 2-6 °C (or 35-43 °F). That, too, is written on the label. That's generally the temperature of a refrigerator. Your freezer, on the other hand is supposed to be set around −18 °C (0 °F). This is definitely not the ideal temperature for eating the cheese, but it works great for keeping leftovers for weeks and even months. When we thaw this out, I'd say it's about 95% of what it used to be, but that's more than good enough for an afternoon snack.